Benton Harbor—Rev. Edward Pinkney, home from two and one half years in prison, and supporters from Chicago, New York, and Columbus, Ohio joined with the people of Benton Harbor Sat. May 26 to celebrate the Michigan Supreme Court’s reversal of Pinkney’s fraudulent conviction May 1. 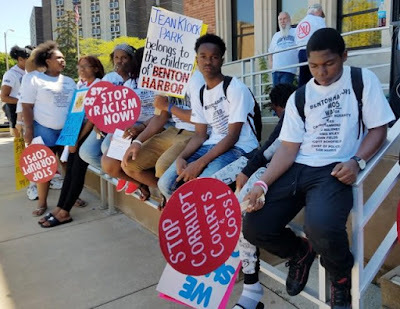 Standing on the steps of the Benton Harbor City Hall, they chanted “FIGHT BACK” against the corporate takeover of their city by Whirlpool, the racist police state and courts, the destruction of the city’s public education system, and the city’s 49.2 percent poverty rate. The rally was held as hundreds of wealthy golfers and fans, 99 percent white, descended on this 86 percent Black town to watch the 77th Senior PGA Tour held at the luxurious Harbor Shores Jack Nicklaus golf course, which abuts the city’s gorgeous Lake Michigan beaches off Jean Klock Park. The park is publicly-owned land, but Whirlpool and its subsidiary Kitchen Aid have claimed it and the surrounding areas for the golf course and multi-million dollar housing development. “OCCUPY THE PGA,” the rally theme, became “police occupy the PGA,” as squadrons of Benton Harbor and Berrien County police turned marchers back from any downtown outlet approaching the golf course. “Parking for the PGA” signs were posted everywhere as travelers entered, even in the poorest stretches of this state’s poorest city. Read the whole story and see photos and videos at Voice of Detroit!